If you’re interested in being a writer, every now and then it’s good to go ahead and read, watch, or listen to something you’re pretty sure you aren’t going to like. First, you might be surprised and actually like it. Second, even if you don’t like it, there might be things about it that you do like and you can use them in your own writing. Finally, if you still don’t like it, you can try to figure out why you don’t like it so you can make sure never to do those things yourself. Along these lines I recently listened to an unabridged audiobook of After Dark by Phillip Margolin. The story is about a wealthy female prosecutor, named Abby. She’s accused of killing her soon to be ex husband and pinning it on a serial killer she had failed to keep in prison. I got the audiobook at a garage sale because of the reasons I’ve outlined above, and because I thought it would be something to listen to while I was cleaning and what not. Although you might think it was a horror novel from the title, it’s actually a courtroom thriller. I’m not particularly fond of those, which is why I wasn’t very excited about it. But there are a few examples of the genre that I have enjoyed, or at least, I’ve enjoyed the movies inspired by examples of the genre. Anyway, the book wasn’t that bad. There have been novels I actually haven’t been able to listen to because of their terrible-ness and this was not one of them. With four tapes comprising the audiobook and two sides to a tape, I had seven golden opportunities to stop listening, but I kept going, and not out of any bloody minded determination to continue to the end, but simply because I wanted to know what would happen next. Why was this? Well part of it was, of course, that I didn’t know what was going to happen next. The other part was that I cared about what happened next. I would say the first part is relatively easy to recreate in a story: you just don’t tell the reader everything all at once. I say it’s relatively easy, because it can be hard to remember to be coy about exciting details when you’re chomping at the bit to let them all come out in a gush of exposition. The second part is harder, though. It revolves around creating sympathetic characters, or at least characters who are interesting. The most interesting character in After Dark is the serial killer Charlie Daniels, with his charmingly evil demeanor and love of game shows. You pretty much know he has had something to do with all the deaths, the question is more about how Abby and her attorney, Mathew Reynolds can prove it. Matthew has a quiet intensity and a desire to not let any of his clients get the death penalty. 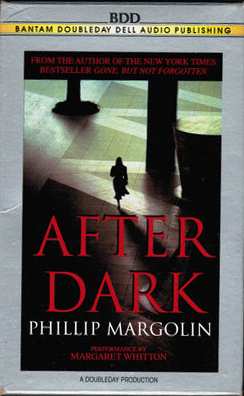 The title of the book, After Dark refers to what defense attorneys have to do when their clients get the death penalty. They have to go to a court house after dark the night they are executed. It is the thing Matthew is most keen on avoiding. The title phrase is used perhaps over much throughout the last part of the book, but I am glad when an author chooses a title for a reason, rather than on a whim.Tracy, Matthew’s competent assistant, is arguably the main protagonist, as she discovers some secrets that provide many of the twists and that move the plot forward, but oddly, I found her to be one of the least fleshed out characters. In fact for half the book I kept confusing her with Abby. Abby is probably the second most interesting character. At least in the beginning, she shows herself to be very resourceful and assertive, but she has to deal with a very difficult situation. These characters were just interesting enough to make me worry about them and how their stories panned out. Why, though, wasn’t I more interested? It’s tempting for me to say the story was clichéd, because it felt like a lot of other crime dramas. Even though my experience with the genre is limited to the few Grisham novels I’ve read, I feel like I sort of know the drill. But while it seemed like old ground, it wasn’t predictable. Yes I knew all the way through it that Charlie was up to no good, but the main thrust of the story is proving Abby’s innocence, if she is in fact innocent. All of which left me guessing. So if it’s not predictable, what about the story makes me feel as if it is? I think perhaps it’s the way the new information is presented. Although I don’t know what exactly a character might reveal in After Dark, I can tell, simply by context, that they’re going to reveal something surprising. It’s unpredictable, but it’s predictably unpredictable. The feeling is a little like watching a soap opera. When the camera comes in for a close up, you know something emotional is going to be said, even if you don’t know for sure what that might be. The take away of this for me is that although having plot twists may be enough for some readers (Margolin did, after all, get his book published and made into an audio book, which suggests that a good number of people must have read and enjoyed his work), it’s not quite enough to make a work seem fresh. You have to vary the way the twists are presented too. In other words, you don’t want the plot to feel like a mad libs game, where there are surprising moments in a cookie cutter frame work. I think following a character’s natural motivations will tend to keep the cookie cutter feeling from coming up. I’ve never read any interviews or anything from Margolin, but my guess is that he’s a plot first kind of guy. The characters in his stories are colorful, but they seem a little animatronic, tied to the things they must do to get to the next scene rather than free to do as they really wish. One place where I feel this most acutely is when Abby is supposed to fall in love with Matthew. At this stage doubt has been placed on Abby’s innocence, and the seductive manner in which she addresses Matthew lends credence to the idea of her guilt, but it doesn’t quite mesh with how she acted in earlier scenes. This isn’t the only problem with Abby. Before her trial starts, she seems like a competent and intelligent woman, but once the trial starts she seems passive and confused about everything. She’s a lawyer, but there are times where she seems ignorant of courtroom procedure. In one of the Amazon reviews, someone has complained about not knowing whose story the book is telling. I agree with this, but I also know that there are books without a definite singular main character that still work. I think if I have to put my finger on what is wrong with After Dark, it’s that the characters aren’t given enough freedom to act appropriately. Overall I give the book a 6 out of 10.